My boys are a sucker for any experiments that involve volcanoes! We've made a volcano in a jar, a snow volcano in winter, and even made volcanic Easter eggs one year. 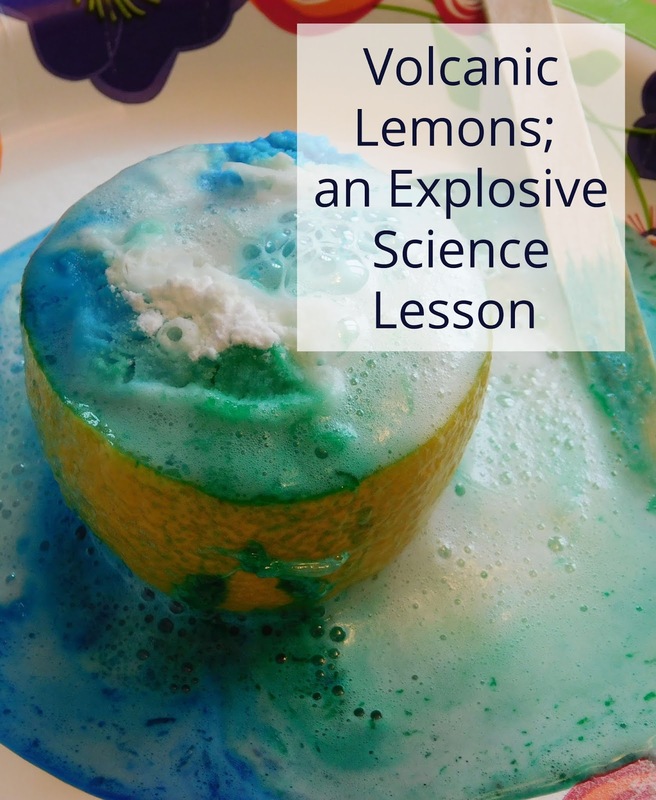 They never tire of experiments that use baking soda and vinegar for these mini explosions so I was thrilled to find that with volcanic lemons the lemon juice reacts with the baking soda for a very minor twist. First we rubbed our lemons across the table pressing down to release the juices. We talked about HOW the lemon juice is acidic just like the vinegar and we speculated which one would work better. We cut the lemons in half (and I cut just a bit off the bottom so they'd sit flat on our plates. Next we used a Popsicle stick to poke holes in the flesh and make the juices rise to the top. When it looked nice and juicy we added just a few drops of liquid watercolors to our lemons (food coloring would have worked great too but when I realized we were out we improvised!). We drizzled a drop of dish soap on top (it makes the bubbles easier to see). Then sprinkled on some baking soda..
And sat back to watch the results. As the bubbling began dying down we poked our lemon a few more times, added some more baking soda and even a bit of jarred lemon juice to keep the "explosions" going. It was a great introduction to our chemistry unit too. This acid/base reaction creates carbon dioxide as it works together to become a neutral. How fun! And a really easy project to put together too! I love projects that are easy and use supplies found around the house.